About Article Factory Manager for Joomla! Article Factory Manager is a complete Article Submission & Approval System for Joomla that has a fully functional revision system, supporting drafts and reverts to older article versions. You can test Article Factory by clicking the menu on the left, and check out the administrative backend by clicking on the menu on top. Article Revision system - past versions of articles are stored and you can revert at any time to any past version! 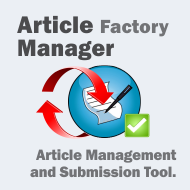 Article Factory Manager allows users to post (submit) Articles – regardless if they are Regular Users or Authors. Any Group of user you choose can submit News and Articles. The great news is that you, as Administrator or a designated User Group can approve from FRONTEND or BACKEND any news in submission order (older article first). This way you can ensure that only valuable articles get published on your site. Screening for spam articles has never been easier. You can set up ALERT words that signal SPAM articles (like well known male products) – This way you become attentive to some articles even if they appear alright at first glance. Articles can be published in the Joomla style with Read More, Page Break and with Images. This way users accustomed to the Joomla system do not get confused and they can easily submit articles. You can limit the number of links present in an article – avoiding this way to transform your website into a link farm. Using the new Quick Reject buttons in the toolbar you can easily reject the problematic articles with only one click. All administrator activities can generate emails to the article authors, announcing them of the status changes of their articles (pending, published or rejected) and of its Reject reason, should you choose not to publish the Article. As the administrator, you are also notified whether or not articles are published on your site and if they are pending for approval. Using the Article Manager Approval System you can easily approve those articles – all pending articles are in a sorted list and will be shown to you one by one in order to be approved. When you approve articles you can perform a word-count, so you can see if the article is too short or too long for your requirements. Also you can easily spot spam posts, since these are mostly low word-count. The frontend approval system allows Webmasters to appoint trusted users to approve posted articles. You can set up a user group that may approve the articles from frontend, providing you with volunteers that accept the articles, but without giving them backend access. This improves your security and your productivity. Integrated Community Builder in Article Manager – You can now set up the Author resource Box as a Community Builder field, and use the CB Avatar image as a signature image for articles. Also featured now a Community Builder PLUGIN that shows your submitted articles and their current status. This way you can see your articles and the articles other users submitted in their profiles. Article Factory Manager allows your users to have a so called “Resource Box” – this is more of a signature text at the end of every article, one that most users will use to advertise their website or blog. This is a commonly used technique to promote websites in article sites (backlinks drive authors to publish on websites). You can see how ezinearticles.com does it. Configuring Article Manager allows you to set up some categories or sections where users are NOT authorized to publish, reserving them for your administrative announcements or for special users. Article minimal length and maximal length can be set up, so no two letter articles get submitted. All the Components email texts can be easily customized. You can use HTML code to add specific signatures and image backgrounds to your alert emails. Users get more attentive to images. New in Article manager: users are allowed to upload images for their Articles in order to include them in the content as image tags. You can disable this feature in configuration if this is not desired. A complete version history of the product as well as the product page can be found here.